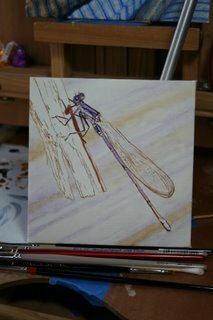 Painting Daily Oil Sketches by Carolyn Hietala: Painting Daily Oil Sketch #2 Damselfly 5"x5" stretched canvas. Very detailed. Close inspection of damselflies reveal their intricate construction. Small Realistic Studies in Oil. A step-by-step oil painting blog journel not intended for art instruction but as a document of my personal "On the Job Training" learning experiences in painting. Sessions are kept short as time on them is during breaks from current works therefore are not completed in just one day. The style I use is realism and my goal is that each new painting will bring me the satisfaction in knowing that I gave it my best. 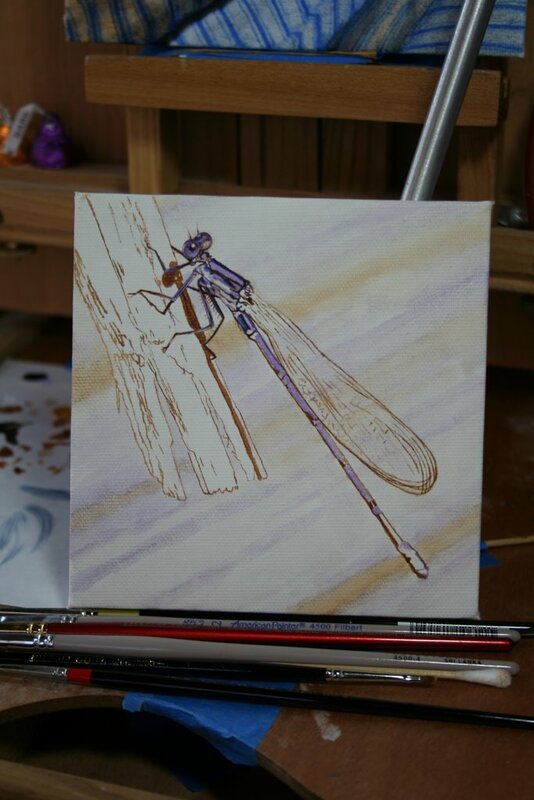 Painting Daily Oil Sketch #2 Damselfly 5"x5" stretched canvas. Very detailed. Close inspection of damselflies reveal their intricate construction. This painting, still a work in progress, was begun a few months ago but I had set it aside to dry.....got busy and simply forgot about it. Oops. I intend it to be very accurate to the photograph my daughter took of this little insect. It actually landed on her arm during the photo session. I began with a careful drawing using a turp/oil wash of burnt sienna, a really tiny brush and a steady hand of course. No second cup of coffee ;0) I then proceeded layering thin color washs to establish an underpainting on which to build. Congratulations to Mother Nature! Thanks to my daughter for providing me with a beautiful reference photo! I have created Art in one form or another since childhood. I took one year of Art in high school and a fashion drawing class at Virginia Commonwealth University so am essentially self-taught. All copyrights are held and retained by me for my artwork, photographs or poetry.